The BACnet Building Controller Small Display (BBC-SD) is a compact, addressable network display device for MS/TP based BACnet networks. It enables users to quickly monitor their system, and easily make changes to the way their building is controlled. The wall mounted BBC-SD has a touch-screen operator interface with permission based menu icons, allowing simple navigation to read and write BACnet values, view alarms, grouped data, and point descriptions. 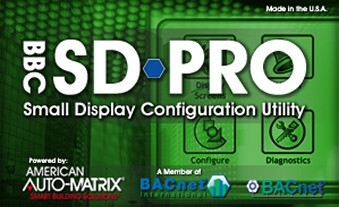 The BBC-SD is easily configured via the Windows®-based BBC-SD-ProTM Configuration Utility. SD-Pro is a PC-based configuration environment used to setup and configure the operational parameters of the BBC-SD. Through the use of this software users can define key data from BACnet MS/TP units which will be displayed on the screen for monitoring and modification. Once all configuration parameters have been defined, a configuration file can be generated (saved) and transported to the BBC-SD through the use of its local SD-card socket or via BACnet File Services.